The above statements were taken directly from the Voice of the Martyrs website at www.persecution.com. While these statements show some of the persecution Christians feel in other countries each day, it doesn’t show them all. 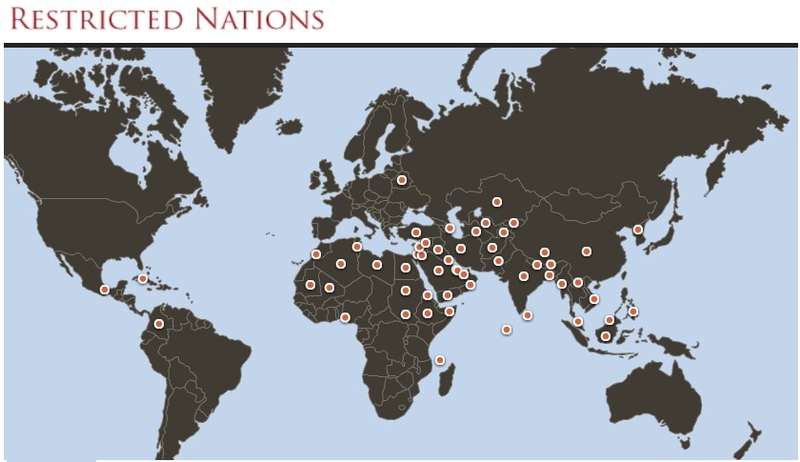 China, North Korea, Columbia, Belarus, Philippines, and many, many other countries restrict or forbid Christian worship. But how much longer until we, “The Land of the Free”, will undergo persecution? The answer is…we already do. When a company is harassed because it refuses to allow birth control to be offered as part of its government-controlled employee benefit package due to its Christian beliefs, that’s persecution (Hobby Lobby). When a company is defamed by the media and “stars” because of its Christian stance against homosexuality, that’s persecution (Chic-Fil-A). A New Mexico photographer was found guilty of discrimination in our own court systems because she refused to photograph homosexual couples. Gallaudet University of Washington, DC, punished a tenured staff member for signing a petition against gay/lesbian marriage. Our own teachers are not allowed to pray with students, or discuss Biblical topics without risking their jobs. And finally, a couple in Venice Florida are being fined $250 a day for holding a Bible Study in their own home, which the city says is against zoning laws. Friends, these are just a very few of the incidents where persecution happens in our own country. We have lost so much ground in our government system already by not being the bold fighting Christians we are called to be. Where were we when prayer was taken out of the schools? Where were we when alternate lifestyles became approved for media? Why are we not taking EVERY SINGLE OPPORTUNITY we have to pray in public, witness in public, and be the Christian voices we are called to be? Have we become ashamed of the Gospel of Jesus Christ? It’s time to take self inventory. Do you pray over your meals in public? Why not? Do you only wear your Christian t-shirts to Christian events? Why is that? Do you talk about your church at work to those that aren’t Christians? Why not? We’re not meant to simply live in peace among those who don’t believe. We’re called to be salt, and when you get salt on a wound – it hurts - but it heals. God’s word is very clear. 2 Timothy 3:12 says “Indeed, all who desire to live a godly life in Christ Jesus will be persecuted.” Jesus Christ Himself warned us when He said in Matthew 5:11 “Blessed are you WHEN they revile and persecute you, and say all kinds of evil against you falsely for My sake.” It’s not “IF”, its “WHEN”. 1 Peter 2:23 says of Jesus, “when He was reviled, did not revile in return; when He suffered, He did not threaten, but committed Himself to Him who judges righteously”. It’s about commitment. Just as Jesus committed Himself to God, who judges righteously, we must commit ourselves, yes, even to death. If Jesus isn’t worth dying for, who is? The issue is that we have become people pleasers instead of God pleasers. We have locked our lips on issues such as adultery, fornication, abuse, anti-Christian religions, homosexuality, and the “popular” sins of the world in order to “fit in” as people would have us to. We’ve refused to be called radical Christians, which is exactly what God wants us to be. Jesus said that to follow Him we must be able to walk away from mother, father, sister, and brother (Luke 14:26) for His sake. You have to be committed to Him. And in being committed, others will be saved. There’s been a lot of talk about the past week’s elections, presidential and otherwise. But I submit to you that one man cannot determine the fate of this country if the thousands of Christians who live in this country will stand as what God has asked them to be. Our soldiers fight for freedom across this world for other less fortunate countries, and they protect us from being overpowered by other nations. But we have a war within our own national boundaries. Our soldiers do not have the freedom to fight this war. You don’t have to put on camouflage gear in the mornings to fight this fight. You just need to wear the armor of God (Ephesians 6), and stand for the One who loved you to the grave and beyond. Pray for your brothers and sisters in Christ that are suffering across the world. We are all part of the same body, and if they hurt – we hurt. Pray also for our country and for the rising up of a new generation of Christians who are not afraid to be bold and be counted.